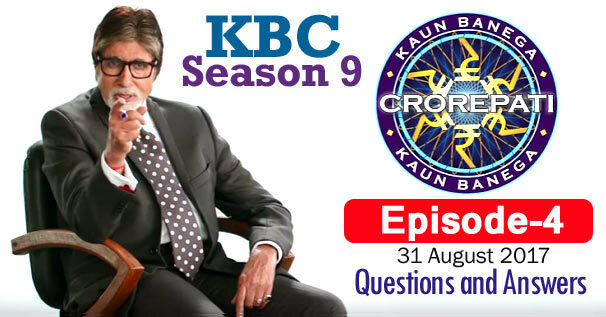 KBC Season 9 Episode 4 Questions and Answers: The fourth episode of Season 9 of Kaun Banega Crorepati (KBC) was telecast on 31st August 2017. In which Amitabh Bachchan had asked contestants 19 questions of General Knowledge. The correct answer to all the questions is given below each question. By reading these questions, you can prepare yourself for the next KBC Season 10 of Kaun Banega Crorepati. Because by reading these questions, you will understand what kind of questions asks Amitabh Bachchan in KBC. These all general knowledge questions will be helpful to for you various Competitive Examinations and Interviews besides KBC. Remember, the answer to some question may be in accordance with that time, while the answer to those question may differ according to the present time. 1. Which courtier of Mughal emperor Akbar rebuilt the Kashi Vishwanath Temple in the 16th century? 2. What kind of animal is Kheleo, the mascot of the FIFA U-17 World Cup to be held in India later this year ? 3. Which of these scientists lost their life as a consequence of their own discovery ? 4. Arrange these words to form the lyrics of a famous Hindi film song ? 5. In a song in the film "Bajrangi Bhaijaan" what is said to be "Teri bhookh ka ilaaj" ? 6. Which one of the following is not an internet browser ? 7. What will you get if you subtract 'dedh' from 'dhai' ? 8. Which of these international organizations deals with the rules of trade between nations ? 9. Which cricketer's voice is this ? 10. Which of these Indian states does not have an international border ? 11. In a Public bio, who described himself thus, "Son of a famous father.Father of a famous son. I am the hyphen between them" ? 12. Which one of the following was the first Indian man to reach the final of an Olympic athletics event ? 13. Starting with the largest, arrange these cricket scores in descending order ? 14. Inme se kis shabad ka arth "Halka Garam" hota hai ? 15. In which part of the body is the ornament 'Kardhani' worn ? 16. The 'Odd-Even Scheme' in Delhi was implemented to bring down the alarming high rate of what? 17. Which of these is the name of constellation, a group of starts ? 18. Whose voice is this ? 19. Which of these organ is also called 'pitaashay' or 'pitt ki thaili' in Hindi?